What's more sweet than a special inter-species relationship? How about animal moms who take in young from a completely different family and care for them as they are their own! I have a very sweet infographic to share today with 10 Amazing Foster Moms in Nature. Shiner and Nibblet had a very special inter-species relationship as many of you know. 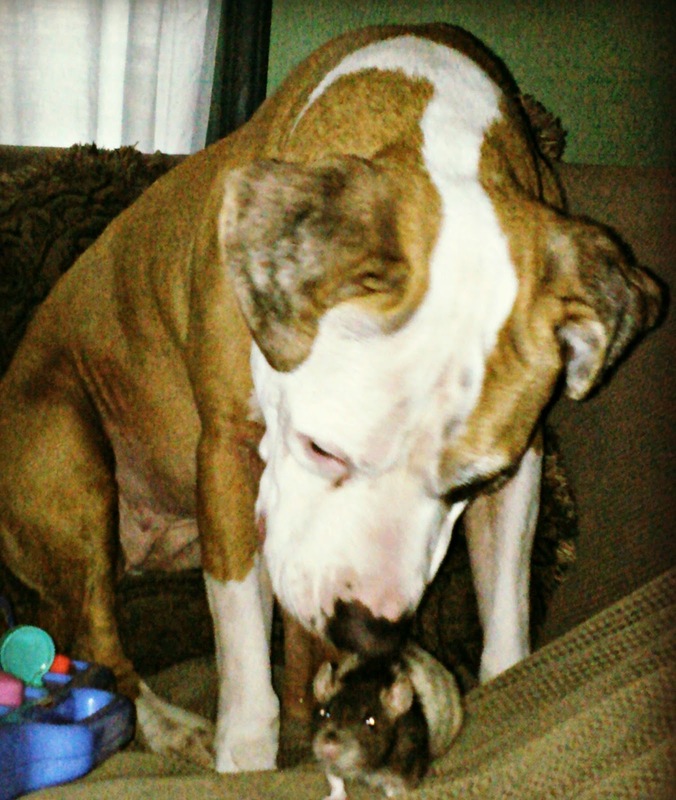 A rat and a pit bull who were best friends. Who would have thought? On top of being best friends with a rat, Shiner was also once best friends with a ferret back when she was but a puppy. I wished she could have become friends with the cat too, but I guess that just wasn't meant to be. This infographic on 10 Amazing Foster Moms in Nature was just too sweet not to share. I love reading about the compassion that some of our animal friends have for others. I'm not sure which of those foster moms and their foster babies is the cutest, it's a tough call! I do like Shrek and Torque though. Let us know which unusual pair is your favorite in the comments! How cute is that? Specially Torque and Shrek are so beautiful. But Shiner and Nibblet are just THE BEST! Have a super friday! Torque and Shrek are too cute but I kinda like Tink and Pink myself. All are absolutely adorable. Happy Friday, Miss Ann and Shiner! Yea, I do like their names - perfect! Those are just amazing and she is coo, cooing at the pix. Nice one. Have a fabulous Friday. I just love stories like these; it really shows how compassionate creatures are. Great infographic, Torque and Shrek are cute, but so are all the others. Those are just the best ever!!!! Happy Easter to you all, dear friends! I suppose the motherly bond doesn't discriminate. I love it when two different animal species bond. I would have to say my favorite is Koko. Shiner and Nibblet…so cool! I also love Tink and Pink…this whole post just made me so happy! Animals are amazing and awesome. Maybe, but it is hard to tell. Yes we did kind of Dolly. My 2 year old's reaction was the saddest part. As I was taking Nibblet's body out of her cage, Violet ran over to see what I was doing. I was trying to be sneaky but it didn't work. I told her that Nibblet had to go bye-bye and let her say goodbye. Then I put her body in a paper bag to bury. Violet just started crying really bad. She didn't attend the burial/funeral outside but she was still crying when I came back inside. I think it was the saddest part about the whole thing.